The Northwood girls were expecting to win the quad meet against Paint Branch, Seneca Valley, and Wheaton, but they were not expecting to sweep the top five spots in the race. 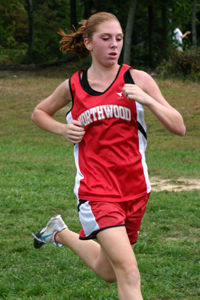 Up until last year, Northwood had not managed to convince five girls to run for the team since the school reopened in 2004. In 2008 they had a full scoring team, and now the team has five strong girls that are mostly young and inexperienced. Freshman Morgan Kershner has led the way for the team so far this year, but no one, herself included, expected her to be the team's best runner prior to the first meet. She ran cross country in middle school and was considered one of the better runners in the area, but found preseason training was much more difficult with the high school. Her first race was the novice 5k at the Woodward Relays. She was the leading girl for nearly the entire race. She finished as the second girl and beat a whole lot of boys, too. Then she realized that she could handle cross country. 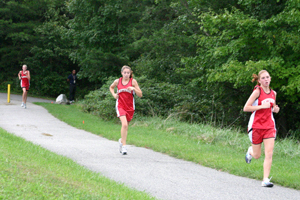 The course at Fairland Park consisted of paved trails, grass, and dirt trails through the woods. The dirt trails were particularly difficult for runners to gain momentum on because of some twists and turns and many tree roots for runners to navigate over. Despite the tough terrain, Kershner ran her best time. She said that she really enjoyed the course with the combination of different terrains and surroundings. Northwood took the top five spots and beat all three opposing teams. Paint Branch's Hayder Cherinet and Northwood's Enricco Reumante both agreed that experience on this course affected the outcome. The advantage, in that case, went to Cherinet who had raced the course and practiced on it many times. Cherinet took the early lead, knowing the difficulty of passing runners on the wooded trails. He wanted to dictate the pace and so he ran at what he described as a "medium" pace. As a result, not only did Reumante stick close, but two other Northwood runners were right behind Cherinet and Reumante throughout the first two miles. 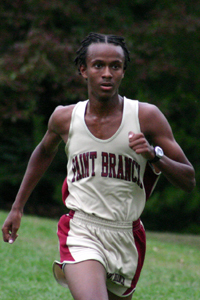 In the final wooded section on the third mile, Reumante made a move to the lead. Cherinet felt Reumante's pace was too slow and recaptured the lead. He charged home for the win in 17:38. Reumante was second in 17:50. Cherinet and Reumante are teammates on the Hummingbird Track Club in the summer time so they were very familiar with each other. Cherinet said that he had been trying to chase after Archbishop Carroll's Petros Welday all summer and is hoping for a great year. He is especially looking forward to Bull Run this weekend where he said he thinks he can break 17:00. The rest of the Paint Branch team used their experience to jump out to an early lead. 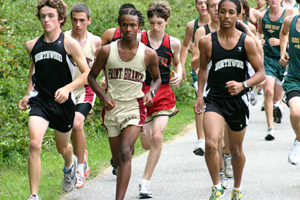 A large gap between Northwood's third and fourth runner in the early stages of the race was filled with Paint Branch runners, but over the final two miles, the Northwood guys proved to be too strong for the Paint Branch pack and won easily against every team by taking the second, third, fourth, and fifth spot in the race. it's enricco, not giovanni. What were the winning times? you guys need faster runner like some one who can run it in 21 to 22 mins! !